Healthy Inflammation Response* 60 hexane-free softgel capsules . Promotes normal cell growth* . Promotes healthy joint function* . 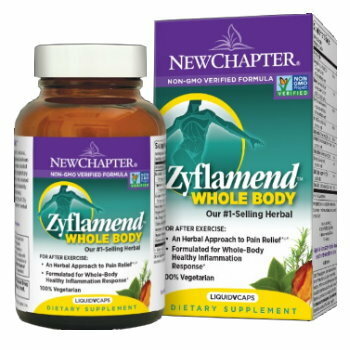 Promotes a healthy inflammation response* New Chapter's patented Zyflamend® formulation represents a scientific breakthrough in promoting a healthy inflammation response. Recent research studies suggest this may be an effective strategy to promote healthy joint function and normal cell growth. * HOLY BASIL TURMERIC, GINGER, GREEN TEA, ROSEMARY, HU ZHANG, CHINESE GOLDTHREAD AND BARBERRY, OREGANO, BAIKAL SKULLCAP.